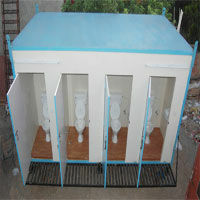 A buildTech is providing Moveable Washroom facilities. These portable washrooms are most appreciated for its sanitized features. Moveable Washroom is available for both ladies and gents. Whole segment is divided into two parts (Four are both side). This Moveable Washroom offers you both western and Indian style washrooms with all services. We are designing these toilets with immense facade, hygiene system and natural steadiness. All types of Moveable Washroom can be modified according to your necessity. Consumers can purchase these washrooms from us at industry leading price.